**WARNING** Although I don't see this causing any damage, I take no responsibility for anything this may do to your system. Use at your own risk and please make a backup before running. 8/2009 - Future Work on these tools: I don't plan on any further development on these tools. I am not ruling it out, but its definitely in my future plans at this time. I have put a lot of my time into this and other MJ related project (i.e. thin client firmware, walkthroughs), so I am moving to the back seat on MJ projects and letting some of the very creative minds here crack the MJ username/password mystery wide open. I thank you all for your encouraging words and I will still be around since I still use MJ as my backup line now (SIPgate is my primary). 8/1/2009 SIP Info can't find the data is did before. The latest update changed something which could have been encryption or possibly changing where the sip data is kept. I created a simplified app called SIPDump which basically dumps the magicjack.exe executable and pulls all the string data from it. It's essentially an easier way to use pmdump. It's really more of a cleaned up executable dump, but I didn't feel like renaming it afterwards, so I kept sipdump. It's also simplified in that it doesn't need any entries in the config. Download it and dump it in the MagicJack Utilities Suite directory. Then run it manually and follow the directions. I don't know where the SIP data is anymore, but post in this thread and maybe someone can figure this out. One interesting thing I see is that the MagicJack executable is pulling password data from other locations for some reason. I saw my gmail password in the MagicJack.exe dump which makes me wonder why they are pulling this data. Maybe someone else can clear this up. The suite still appears to work after the 4/9 MJ upgrade for those interested. I decided to incorporate several of the apps I have written into an easy to use GUI. It includes the SIP Info checker, MJ Upgrader, and some other nice features. Regarding the SIP Info checker, it will pull your SIP credentials from your MagicJack. This is purely for educational purposes and should NOT be used to circumvent your MJ hardware. This is against their TOS and should not be done. Here is the previous version just in case the latest version (above) doesn't work for you or you just like this version. 1. Unzip the folder and put it where ever you like on your system. 2. Once done, you can run MagicJackSuite.exe and go from there. 4. (Optional) - Create a shortcut to MagicJackSuite.exe on your desktop. This will make it easier to run in the future. Not really sure if its a bug or not, but sometimes you have to run the SIP Checker app more than once to get the SIP data. It really has to do with the timing of pulling the SIP data when magicjack starts. Since different systems run this at different speeds, its hard to determine a time value that works across the board. See version 1.5 update as there was a bug in some versions before it. -Added "MySIPInfoLocation" variable to Optional section of the config file. You can select where you want to save your MySIPinfo.txt now. -Added mouseover tooltips to each of the buttons on the main interface. - Fixed a possible bug causing a bluescreen on one of my test environments. Appears to be from some code I introduced on v1.2 and continued through v1.41. Might have just been my system, but upgrade just to be safe. - Added Configuration with GUI interface to make the suite easier to setup. - Fixed a bug in the GUI where it would not read the values from the config file after changing them in the GUI. Caused it to run with old values until you would exit and restart it. Issue now corrected. Source: I wrote this app using a freeware scripting program called AutoHotKey (http://www.autohotkey.com/). Also, thanks to all the members here who posted the info that allowed me to write this app. It's been a while since I posted any updates, but since my thread is now a sticky I figured I would provide at least one more update. Here is an update to the SIP Info that should be more reliable in pulling the SIP Info on the first try. Please read all the info below before running and please provide feedback on if it works better for you than previous versions. - Changed method of pulling proxy name. Should be more reliable. Note that this just pulls what MJ says your proxy should be. Make sure you already have MJ Suite 1.6 downloaded and setup correctly. Simply overwrite the sipinfo.exe on your computer with the one in the download link. Everything else is the same with the exception of the delay setting in the config. You can set it, but it will be ignored. Diskspace Concerns: The trade with my new approach is that you will need around 400mb free diskspace (temporarily) running this version. The older versions ran a single dump and searched it for the data needed. This version does the same thing, but 3 times in a row causing around 400mb in files while its running. It deletes the temporary files after it runs just like previous versions. Hi Stroths, nice touch on the integration, excellent, it upgraded my software and pull my SIP info without a problem. I am running on Vista X32. This is on an XP machine. The suite can start but not stop magicjack.exe correctly by using the buttons. This is on an XP machine. The suite can start and stop magicjack.exe correctly by using the buttons. The script is using the taskkill command which should be a standard exe in your Windows\System32 folder. See if you have C:\Windows\System32\Taskkill.exe on your system and let me know. EDIT: You can download it at the link below and copy it to your Windows\System32 folder. EDIT2: Updated suite to v1.1. I added the taskkill binary in and updated the code to reflect the location. You can keep your existing config.ini from 1.0 if you want because nothing in it has changed. Not having taskkill was the problem. Everything worked fine. This is it, outstanding that's all we need, most amazing. This file was saved to C:\Users\Dragon\Desktop\MagicJack Utilities V1.2\MagicJack_Utilities\MySIPinfo.txt. I don't think the ports are needed, ports should be 5070 and 5060.
for any ATA, soft phones or Asterisk PBX. May be that info will be good if some one needs to mess around with the router. Can you or someone else verify that the info it pulls is correct? 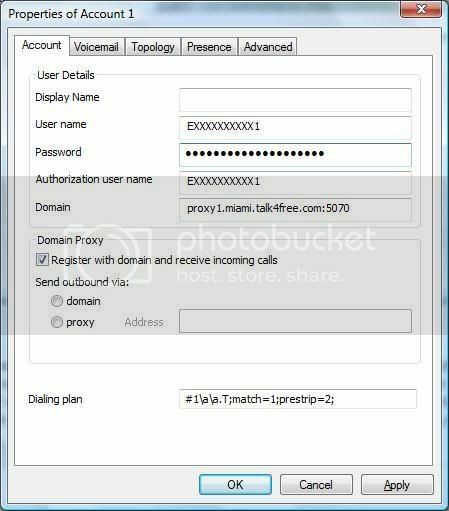 Also, does anyone know of an easy way to check if the user and/or password data is correct without using an ATA of any alternative softphone app? It is 100% accurate, I have been running MJ in a PAP2t for 6 mo. now, but they keep changing the User-Agent, before I always have to run WireShak and it was time consuming now it is so fast, thanks to you. Actually you don't have to put the User-Agent, but it make easy for them to discover you are running an ATA. You are very welcome. Do you know what some of the past user-agent strings were? Curious to see if they are different enough to cause an issue with my code. It was probably when you give us the option to change the StartDelay what made the difference I think. But I really don't have any more ideas. I just try it in XLite soft Phone. 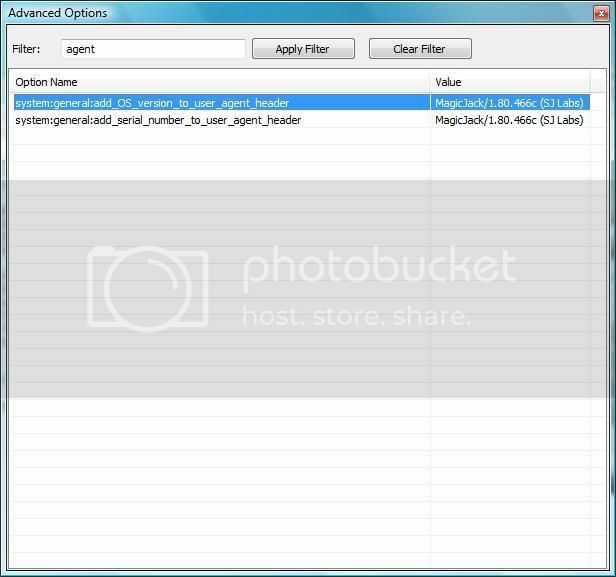 and then filter for Agent and copu your current User-Agent Version. May be you want to give it a try, it take 10 sec. to configure. Yes just go to the SIP tab on your PAP2 in advance mode, and under SP Reg User Agent name put your current User-Agent. eg MagicJack/1.80.466c (SJ Labs), just cut and paste the whole string.